Wainwrights Pictorial Guide to the Eastern Fells has a 28 page chapter on Helvellyn. The rest of the Eastern Fells book covers all the other fells in the Helvellyn and Fairfield range. The work contains fell descriptions, routes, maps and sketches of this mountainous area of Lakeland." To see more fell walking gear suitable for Helvellyn, visit the Lake District Online Walking Shop. At 3,118 feet (950 meters) Helvellyn is the third highest fell in the Lake District, as well as being one of the most popular fells with walkers. The Striding Edge route to Helvellyn summit is certainly one of the busiest. The summit of Helvellyn is at the centre of a massive range that, in the words of Alfred Wainwright, "...[forms] a tremendous natural barrier from north to south between the deep troughs of the Thirlmere and Ullswater Valleys". (Wainwright 1955, Helvellyn 4). Other fells in this range include Dollywaggon Pike, Nethermost Pike, Catstycam, Lower Man, White Side, Raise, and The Dodds. All these are at least 2,584 feet (789 meters) or higher. 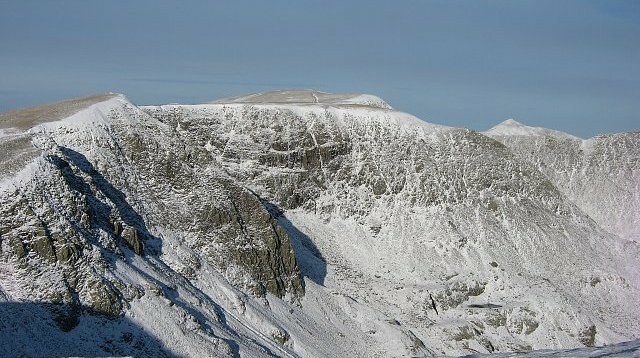 Wainwright also points out how different the Helvellyn range is on its gentler western slopes compared to the mountainous crags and sheer edges on its eastern side. He writes "the smooth slopes curving up from the west break abruptly along the ridge, where in complete contrast, a shattered cliff of crag and scree falls away precipitously eastwards: here are the most dramatic scenes Helvellyn has to offer" (Wainwright 1955 Helvellyn 5). 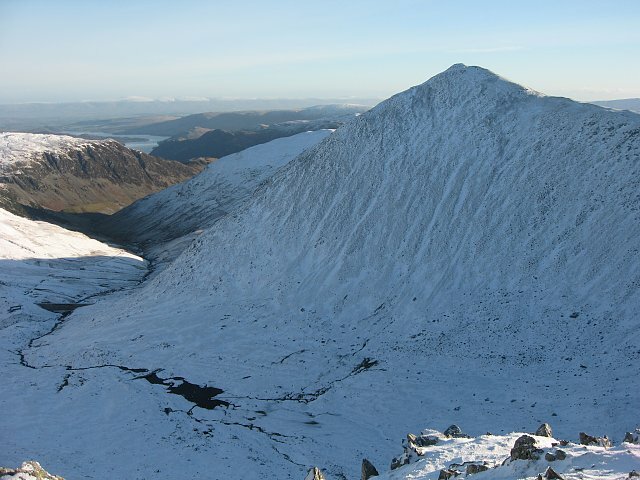 Striding Edge is one of the dramatic scenes referred to by Wainwright above. He describes this ridge linking Birkhouse Moor to Helvellyn Plateau as "... all bare rock, a succession of jagged fangs ending in a black tower" (Wainwright 1955, Helvellyn 5). 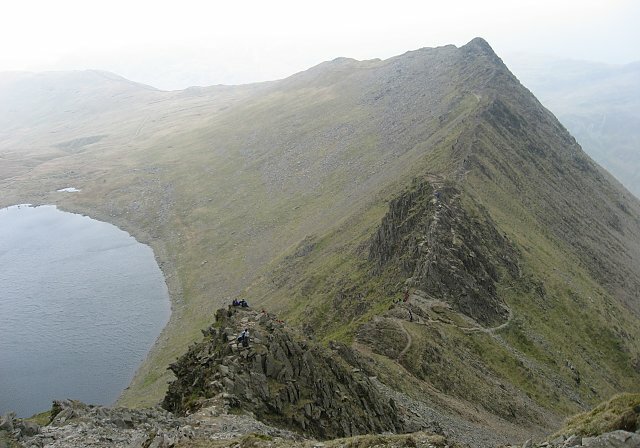 Although Striding Edge can be a challenging route for many walkers, it is generally regarded as one of lakelands easier scrambles. The Striding Edge ascent of Helvellyn often starts from Patterdale, traversing Birkhouse Moor to the "gap in the wall" and the start of Striding Edge. Walkers have the choice of scrambling along the top of the edge, or following a path some meters below. Towards the far end, however, there are sections where some scrambling is unavoidable. I remember being at the end of the ridge waiting on a ledge to descend a short gulley - what Wainwright referred to as a "rock chimney". The weather was wet and misty, but I could see the steep rocky ascent onto the Helvellyn Plateau ahead. To my left was a sharp drop down to Nethermost Cove hidden in mist. The view through this misty scene was quite awe-inspiring. You can read more about this traverse of Striding Edge in my Lake District Walks blog. Once this vertical rock gulley is negotiated by climbing down 10 feet or so, using the hand and foot holes , there is the steep scramble up to the Plateau, which is then just a short walk to the summit shelter. Below Striding Edge just to the north, is Red Tarn. This is surrounded by high ground on three sides. The high ground north of Red Tarn is that of Swirral Edge , a rocky ridge that joins the peak of Catstycam with the main Helvellyn plateau. Swirral edge is an excellent ridge walk, even though Striding Edge is the more challenging route. 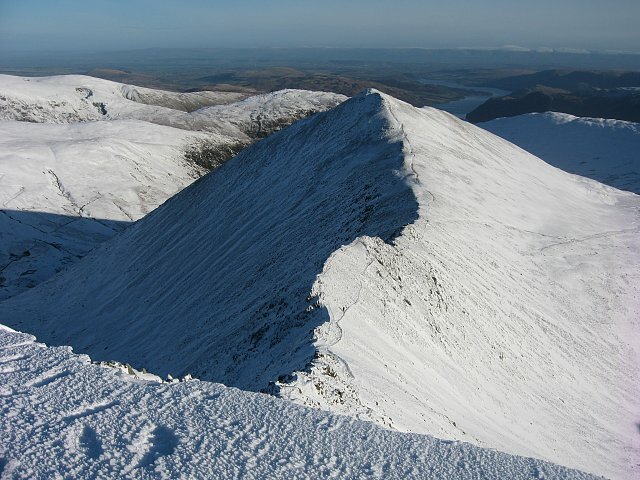 "If Catstycam stood alone, remote from its fellows, it would be one of the finest peaks in Lakeland. It has nearly, but not quite, the perfect mountain form, with true simplicity in its soaring lines, and a small pointed cap, a real summit, that falls away sharply on all sides" (Wainwright 1955, Catstycam 2). 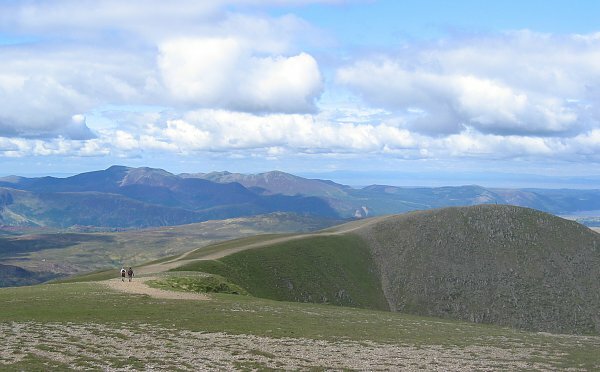 The Helvellyn range is essentially a long broad ridge going from south to north, with Helvellyn summit being the highest point. From the south, this ridge rises from above Grisedale Tarn to Dollywaggon Pike, and Nethermost Pike. The ridge then rises to the main Helvellyn plateau. 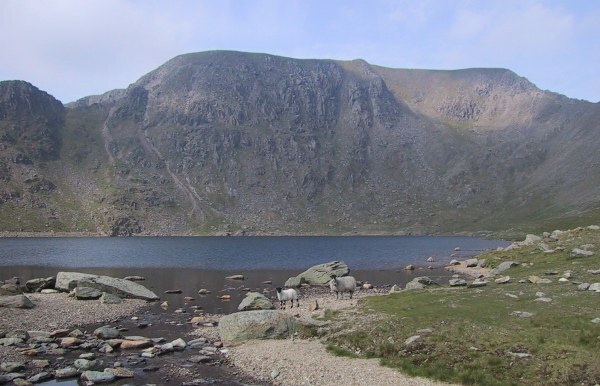 Wainwright describes Helvellyn as being "... a high point on a high ridge ... substantially buttressed by neighbouring heights ... the connecting depressions being relatively slight" (Wainwright 1955, Helvellyn 4). As such, walkers approaching from Grisedale Tarn, have done most of the hard work once they have ascended the steep zig zag path leading towards Dollywaggon Pike. From here, the walker can take the straight path to Helvellyn summit, or take a slight detour to visit the summits of Dollywaggon and Nethermost Pike's. This makes the walk more interesting, but would involve some relatively minor ascents to reach the summit's. 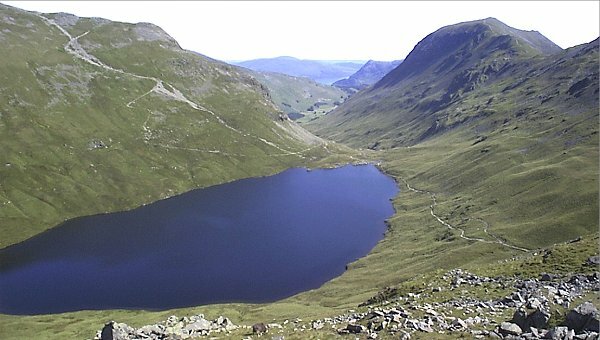 To begin the southern approach to Helvellyn, there are two routes taking the walker to Grisdale Tarn. The first goes from Grasmere in the south west. This follows Tongue Gill between Seat Sandal and Great Rigg to reach Grisdale Tarn. The second route is from Patterdale in the Ullswater Valley. This follows the beck up Grisedale valley to reach the tarn at its head. 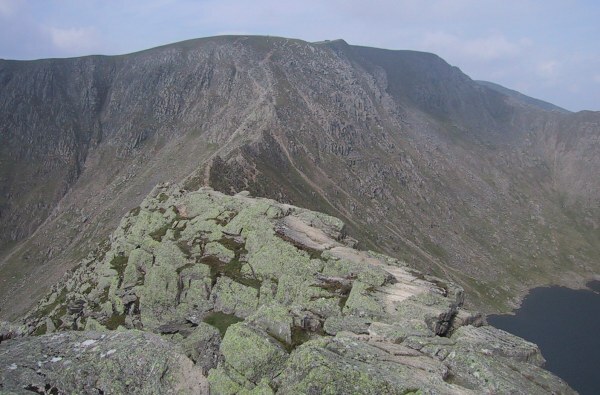 There is also an ascent of Nethermost Pike via Coomb Crags and Birk Side. This begins from Wythburn on the western flank of the Helvellyn range, and joins the ridge path just north of Nethermost Pike. From here the path continues north rising onto the main Helvellyn summit plateau. Going north-west from Helvellyn summit plateau, the land drops gently to Helvellyn Lower Man. Here the ridge branches off to the north, heading towards White Side, Raise and the Dodd's, whilst another ridge continues to the west where it descends gradually to Thirlmere via Browncove Crags. 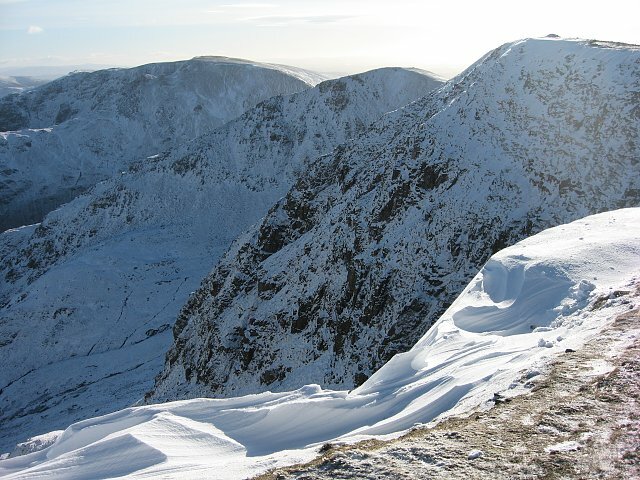 There are a number of routes for walkers who want to ascend Helvellyn via White Side and Helvellyn Lower Man. The ascent of Helvellyn via Browncove Crags starts from the carpark on the edge of Highpark Wood, and follows the course of Helvellyn Gill. It then branches off to the right where it skirts the edge above Browncove Crags, and then follows the ridge to Helvellyn Lower Man. From here it is a gentle ascent to the main Helvellyn summit. A similar route starts from Thirlspot Farm a short distance down the road from Highpark Wood. 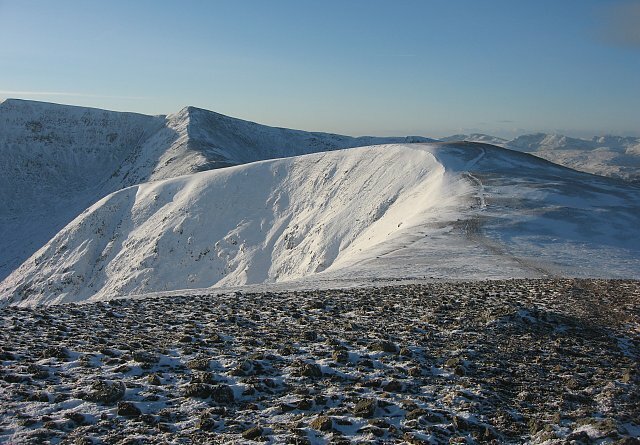 This route takes the walker up the slopes of White Side to join the ridge connecting White Side summit with Helvellyn Lower Man. From here it proceeds up to the main summit. 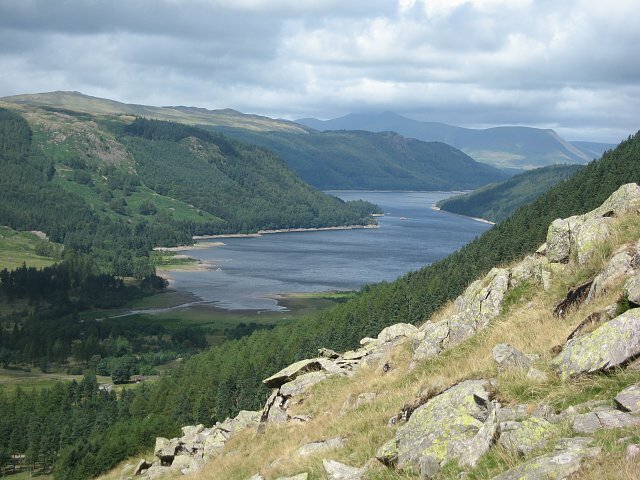 There is also a route that begins from the Youth Hostel at Glenridding in the Ullswater valley. This heads east towards Kepple Cove where the path ascends to the summit of White Side. From here it proceeds along the ridge to Helvellyn Lower Man and then onto the main plateau following the same route as above. A collection of You Tube Videos made by various people during their ascents of Helvellyn.